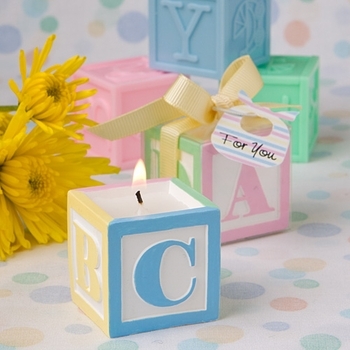 Designed to resemble toy alphabet blocks, these cute scented baby block candles are great shower favors and a charming keepsake for any child themed event. Remind your guests of their own childhood with these traditional candles that are a classic expression of our first encounter with letters. Each candle measures 1 1/4 inches square. Each alphabet block highlights a white outer face with the letters A through D on four sides. Each letter is hand painted with a different pastel color � blue, green, pink or yellow � and has a matching color border. Poured inside the block is a deluxe, scented white candle. They are presented in a clear box tied with a yellow satin ribbon. There�s even a matching "For You" tag shaped as a multicolored bib.